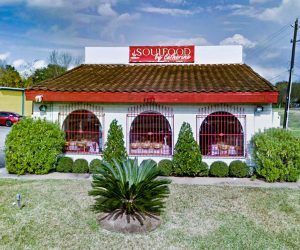 Five years ago this month, Soul Food by Catherine opened its doors to Five Corners residents and friends looking for an extra helping of soul. After teaching math in Louisiana for almost 35 years, owner Catherine Reado Simon put lesson planning behind her, and made her retirement plans a reality: owning a restaurant specializing in homestyle southern meals. I sat across from Catherine at a table near the serving line, amidst customers trickling in to order home-made favorites like smothered pork chops, smothered oxtails, or (as I also ordered), delicious deep-fried baby back ribs. As we spoke, cars circled through the small building’s drive-thru line. An “Uber Eats” sign reminded customers of the option to have Catherine’s food delivered straight to their homes. “When we started out, the recipes were strictly out of my head, with a few exceptions. Brown gravy over rice is one of my specialties here, and I learned that from my mother. The collard-greens recipe is my brother’s,” she explains. Catherine’s brother, a successful restaurant franchise owner in Houston, was the catalyst behind the opening of her restaurant. “He always said that when I retired, he would put up the money to start a soul food restaurant, as long as I would move to Houston.” So, over the Thanksgiving holiday of 2014, the time was right for Catherine to pack up her math books and move her family to Houston. Oxtails was one of the dishes Catherine’s employees were inspired to add to the menu in the early months. 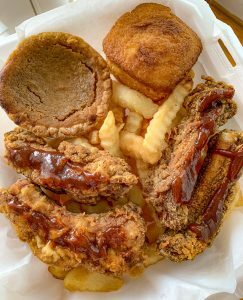 “We realized that we cannot have a soul food restaurant without oxtails,” she acknowledges. Oxtails, or cattle tail, show up in cuisines on every continent, and are a southern soul food essential. Typically, oxtails are braised, stewed, or smothered, and feature primarily in Caribbean and soul food eateries. Their chicken, shrimp and sausage gumbo, as well as the bell peppers stuffed with ground beef, shrimp, and rice are exclusively made by Catherine. She notes, “Growing up in Lake Charles, I only ate gumbo and seafood. I didn’t eat meat until after I married!” Now, she adds her own personal flair to the family gumbo recipe, which makes it difficult to be replicated. Hungry customers will also be tempted by soul food classics such as chitterlings (or chitlins), okra, or smothered chicken, perfectly washed down with a Kool-Aid or peach tea. If you come on the right day, you might see Catherine’s son or one of her daughters behind the counter. While pursuing careers of their own, they make time to help out in their mother’s business.